Whether it is at the local, state or federal level, document management for government agencies continues to be a challenging undertaking. The overwhelming amount of paper-based documentation and records multiplied by the vast number of government offices that maintain them makes transitioning to digital a monumental task. This transition is unavoidable with the rise of digital government and the growing emphasis on open data policies and inter-agency collaboration. With many government offices still running paper-based processes, there is a need for document imaging solutions that not only accurately converts paper documents to electronic data, but also allows agencies to proactively meet regulatory compliance requirements. 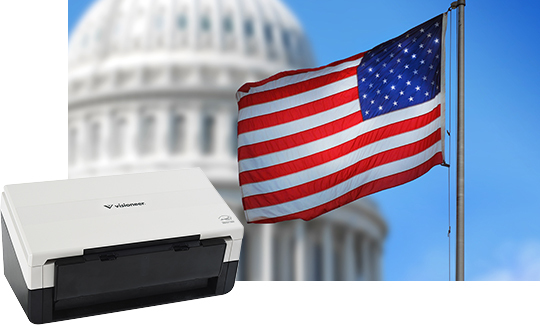 Visioneer scanners are designed to improve records management and productivity and help meet regulatory compliance requirements of U.S. Government agencies and private sector users who require GSA/TAA-compliant products. Our scanners are all driven by Visioneer OneTouch and TWAIN, delivering seamless scanning experiences that increase workforce productivity while enhancing information delivery to both constituents and other government agencies. The Visioneer Patriot series are TWAIN driven, TAA-complaint scanners ranging from personal to low-volume production workflows. Paired with a powerful software suite, these scanners produce clear and concise images, great for any government workplace.